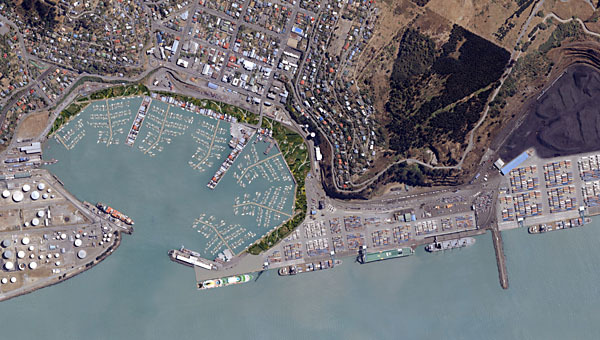 Lyttelton Port of Christchurch is the largest Port on the South Island of New Zealand. It’s the largest coal export facility in New Zealand and has been exporting coal from its stockyard in Te Awaparahi Bay since 1976, with other port facilities including: Wharves, secure storage sheds, bulk discharge and other facilities are provided for a wide range of conventionally stevedored cargoes including bulk petroleum, fertiliser, gypsum, logs, cement, conventional break bulk, imported cars and fishing. Lyttelton Port has recently completed Cashin Quay 2, built to help the port handle 30 years of growth as Lyttelton Port of Christchurch competes for shipping traffic and road freight, by doubling its container capacity over the next decade and brace it for future competition. Cashin Quay wharf 2, and an adjacent storage area for 1200 twenty-foot containers, were designed to handle a new generation of larger container vessels. It is seen as the next step in changing the port’s services and help set up the company for the next 30 years with 20 foot container throughput increasing from more than 370,000 to about 1.2 million by 2043. The earthquake rebuild of the port is funded via an insurance payout of nearly $440 million after protracted negotiations with insurers, and the new wharf is built to meet the latest international seismic code. The Port and town of Lyttelton are on the north shore of Lyttelton Harbour, a sea inlet in the north-west of Banks Peninsula on the coast of Canterbury in the South Island of New Zealand. Banks Peninsula is a volcanic island, built of lava from two craters situated in what are now upper reaches of Lyttelton and Akaroa harbours. Erosion and changes at the end of the last Ice Age resulted in the drowning of both craters. Lyttelton Harbour, called Te Whaka, or Te Whakaraupō (the harbour of bullrush reeds) by the Māori and Port Cooper by one of the earliest white visitors, runs westwards for 13 kilometres between two headlands, about two kilometres ride. Māori has lived in and around the area since 800AD.